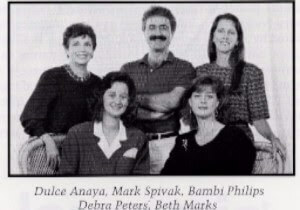 In 1992, five talented determined choreographers gathered around a table, put in $100 each and created Community Nutcracker, Inc. Dulce Anaya, Beth Marks, Debbie Peters, Bambi Phillips and Mark Spivak envisioned an organization which would produce The Nutcracker Ballet utilizing local talent, maintaining a high level of artistic quality. Additionally, they determined that a portion of the proceeds should be donated to charity. The Leukemia Society of America was the first beneficiary of the Community Nutcracker's efforts. Community Nutcracker, Inc. was officially formed in August 1992. In a few short months, the Artistic Directors, along with dedicated volunteers, dancers and parents, were able to produce the premiere production on December 13, 1992. There were two shows at the Florida Theatre of the Performing Arts. 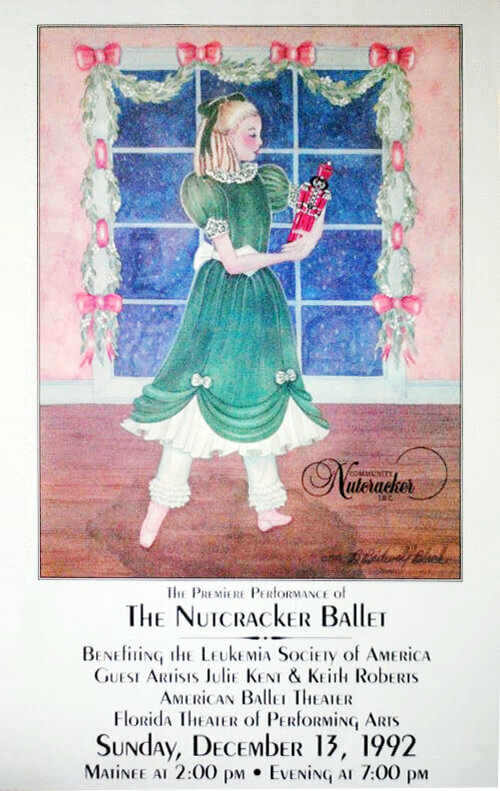 The poster advertising the show was painted by Barbara Bidwell Black, a local artist whose own daughter, Annie, performed with Community Nutcracker in later years. Beth Marks was the model for the poster and the background was a window in her parents' home. From the start, Community Nutcracker was the effort of all using their own unique talents. Our first guest artists were Julie Kent and Keith Roberts who were soloists with the American Ballet Theater at the time. In 1993, Ms. Kent was named a principal dancer with ABT and remained with ABT until her retirement in 2015. Ms. Kent is now the Artistic Director for ABT's Summer Intensive Programs. The first cast was 140 dancers strong (excluding the principals) and including a performer who still dances with us — Dr. George Trotter. Dr. Trotter has been performing the role of Herr Drosselmeyer from the beginning! The first Clara was Shannon Biggs and Christmas Spirit was performed by Rhonda Stampalia. Ms. Stampalia is currently the director of the Ballet Department at Douglas Anderson School of the Arts. Ms. Dulce was recently asked how the four current Artistic Directors have stayed together for so long. Ms. Dulce replied that they get along so well and each contributes their own talents, time and energy to produce a show which is truly the collective effort of all involved. Her greatest joy received from working with Community Nutcracker is seeing dancers eager to learn and ready to participate. She loves dance so much that she wants to share her love of dance and music with the dancers and to see them enjoy these things she holds so dearly. Now it is your turn. How has Community Nutcracker influenced your life? What are your favorite memories of being a part of one of our productions? What makes Community Nutcracker special to you? Help us celebrate this very special year by sharing your stories with us.